Are you feeling that something’s just not right? 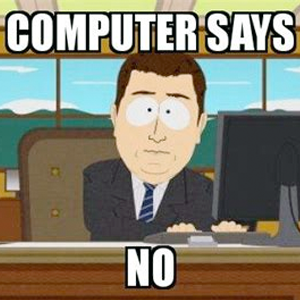 Computer Says No?!! Our aptly named Internet Clinic is here to help diagnose any issues you are having with the internet or office IT. Problems might manifest themselves as a sudden or gradual downturn in business/sales or traffic on your website; customers reporting issues with your website which you can’t seem to replicate; large bills for things you don’t understand and so forth. As you would visit a doctor if you’re not feeling quite right, use our Internet Clinic to drop in and get an unbiased appraisal of your perceived issue. If it’s an “A&E” level of urgency then check our Emergency Help page. We’ll investigate and report back our findings with our recommendations to remedy the situation. We do this without obligation on your part.